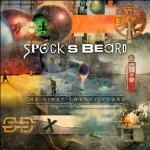 Share the post "Album review: SPOCK’S BEARD – The First Twenty Years"
This has been a busy year for Spock’s Beard with a new studio album, ‘The Oblivion Particle’ and subsequent tour and now this, the band’s first best of album. It covers all twelve studio albums released to date and also a newly recorded song to entice in fans who will already have the music on here. Turning to the new song first ‘Falling For Forever’. This was recorded especially for this album and is over nineteen and a half minutes. The song features all the band’s members both past and present. It was written by Neal Morse, with the vocal duties shared between former vocalist Neal Morse, Nick D’Virgilio and current vocalist Ted Leonard. It is a real tour de force from the band as each vocalist gets equal time in the limelight and there are some stunning guitar solos from Alan Morse. Not to be outdone Ryo Okumoto produces some breathtaking keyboard/organ solos. Fans will adore this song I am sure. Elsewhere the songs were hand picked by the band themselves and glad to see ‘Tides Of Time’ representing the latest album. The trouble the band must have is their songs rarely clock in at less than eight minutes, often much longer, however they have picked a good mix of epics and their shorter songs. Really pleased to see ‘June’ makes the album, a lovely acoustic song full of the band’s trademark vocal harmonies and a song that has appeal way beyond the prog rock field. This entry was posted in ALBUM REVIEWS, ALBUM REVIEWS (Mobile), All Posts and tagged Alan Morse, album, Neal Morse, Nick D’Virgilio, prog, progressive, review, rock, Spock's Beard, Ted Leonard, the First Twenty Years. Bookmark the permalink.